Gutsy Gujarat Fortune Giants - The Popular Crowd Favourite! Debuting in the 2017 season of PKL, the Gujarat Fortune Giants team almost had a dream debut. But, unfortunately, the success streak ended in heartbreak when they lost the final match to rivals Patna Pirates. Owned by Adani Wilmar Ltd the team’s home ground is the 4,000-capacity ‘The Arena by TransStadia’. Definitely one of the favourites for the title, the Gujarat Fortune Giants team players are a mix of young blood and fresh talent that bring a refreshingly new perspective to the sport of Kabaddi. The Gujarat Fortune Giants Squad had the best of teams shaken in the past, and almost none of them could break down the fiery intensity that this team brings to the mat. So, let us analyse what makes this team a force to be reckoned with. All-rounder Hadi Oshtorak is no stranger to the big stage, apart from being part of the title-winning team on two occasions, he was also part of 2016 Kabaddi world cup runner up Iranian team. Coming from a family of Kabaddi players, K. Prapanajan has had an impressive career with the Tamil Thalaivas. A master of Do-Or-Die raids, he has over 40 matches under his belt. Sachin Tawar is already making a name for himself in the sport. He holds the record for being the most expensive player in PKL and has justified that price till now. The team has a strong raiding department but can sometimes fall short in tackling. Mahendra Rajput is a seasoned PKL pro with 32 matches to his name. He brings in tremendous raiding talent with a commendable tally of super tackles and super raids. Youngster Ruturaj Koravi is a master defender who can make life difficult for the raiders of the opponent teams. Gujarat Fortune Giants captain Sunil Kumar is a young talent with a mighty passion for the sport. His handy defence position will be pivotal to the team's success. Coached by Manpreet Singh, the team is brimming with youngsters and holds tremendous potential. It will take the opponent’s team a herculean effort to break past the defences and raiding talent of the Gujarat Fortune Giants. The digital age lets you be closer to the action and lets you test your strategies against the best of the best. So if you are a pro in strategising, then head over to Dream11 and put together your best players and enjoy some fantastic winnings. The PKL season has a lot to offer, and this is your chance to be part of a highly engaged fan community. Create your team before every match and join in the online contests for a fee or hone your skills with practice contests. 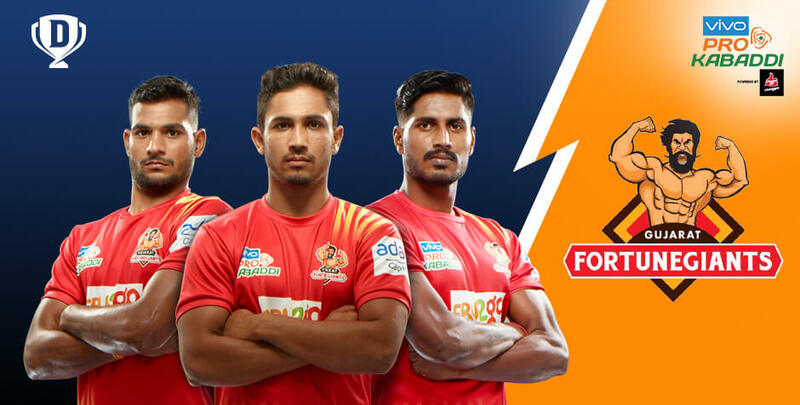 To all explore all these teams and their matches, check out Dream11 right away through their official website or download the mobile app today.